We have been staying at this location for many any years starting in 1994. Love the location of the hotel. I am a true believer in small establishments in local communities. Their amenities a amazing. The staff is excellent. Parking is amazing. Local visitors to this hotel in Carmel. Drink machine has Dollar soft drinks, name brand. Their breakfast is sufficient to get the day off to a great start. Have fans in the rooms if needed, and a heater in bathroom if needed!! Never needed it this trip in October 2014. Was a perfect time to visit. Same time next year God willing!!! 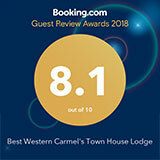 Best Western Carmel Town House is our favorite place to stay in Carmel. We stayed there many times. Seeing JD Desai again & again is like visiting a relative. He smiles a lot. He is very attentive to his guests. His staff are friendly. I recommend anybody to try BWCTH 100%. Thank you JD, you are the BEST.